Lung transplantation involves removal of one or both diseased lungs from a patient and the replacement of the lungs with healthy organs from a donor. Lung transplantation may refer to single, double, or even heart-lung transplantation . The purpose of lung transplantation is to replace a lung that no longer functions with a healthy lung. To perform a lung transplantation, there should be potential for rehabilitated breathing function. Other medical treatments should be attempted before transplantion is considered. Many candidates for this procedure have end-stage fibrotic lung disease, are dependent on oxygen therapy , and are likely to die of their disease in 12 to 18 months. Patients with emphysema or chronic obstructive pulmonary disease (COPD) should be under 60 years of age, have a life expectancy without transplantation of two years or less, progressive deterioration, and emotional stability in order to be considered for lung transplantation. Young patients with end-stage silicosis may be candidates for lung or heart-lung transplantation. Patients with stage III or stage IV sarcoidosis with cor pulmonale (right-sided heart failure) should be considered as early as possible for lung transplantation. Once a patient has been selected as a possible organ recipient, the process of waiting for a donor organ match begins. The donor organ must meet specific requirements for tissue match in order to reduce the chance of organ rejection. It is estimated that it takes an average of one to two years to receive a suitable donor lung, and the wait is made less predictable by the necessity for tissue match. Patients on a recipient list must be available and ready to come to the hospital immediately when a donor match is found, since the life of the lungs outside the body is brief. Single lung transplantation is performed via a standard thoracotomy (incision in the chest wall) with the patient under general anesthesia. Cardiopulmonary bypass (diversion of blood flow from the heart) is not always necessary for a single lung transplant. If bypass is necessary, it involves re-routing of the blood through tubes to a heart-lung bypass machine. Double lung transplantation involves implanting the lungs as two separate lungs, and cardiopulmonary bypass is usually required. The patient's lung or lungs are removed and the donor lungs are stitched into place. Drainage tubes are inserted into the chest area to help drain fluid, blood, and air out of the chest. Heart-lung transplants always require the use of cardiopulmonary bypass. An incision is made through the middle of the sternum. 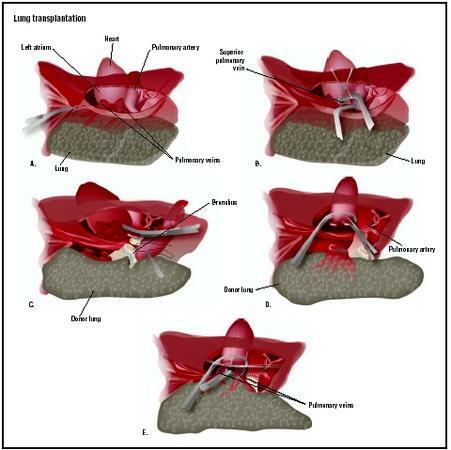 The heart, lung, and supporting structures are transplanted into the recipient at the same time. Patients who have diseases or conditions that may make them more susceptible to organ rejection are not selected for lung transplant. This includes patients who are acutely ill and unstable; have uncontrolled or untreatable pulmonary infection; significant dysfunction of other organs, particularly the liver, kidney, or central nervous system; and those with significant coronary disease or left ventricular dysfunction. Patients who actively smoke cigarettes or are dependent on drugs or alcohol may not be selected. There are a variety of protocols that are used to determine if a patient will be placed on a transplant recipient list, and criteria may vary depending on location. Arterial blood gases (ABG) test, which measures the amount of oxygen that the blood is able to carry to body tissues. Pulmonary function tests (PFTs), which measure lung volume and the rate of air flow through the lungs; the results measure the progress of the lung disease. Radiographic studies (x rays). The most common is the chest x ray (CXR), which takes an internal picture of the chest including the lungs, ribs, heart, and the contours of the major vessels of the chest. Computerized tomography (CT) scan. A chest CT scan is taken of horizontal slices of the chest to provide detailed images of the structure of the chest. Ventilation perfusion scan (lung scan, V/Q scan) is a test that compares right and left lung function. Electrocardiogram (EKG) is performed by placing electrodes on the chest and one electrode on each of the four limbs. A recording of the electrical activity of the heart is obtained to provide information about the rate and rhythm of the heartbeat, and to assess any damage. Echocardiogram (ECHO) is an ultrasound of the heart, performed to evaluate the impact of lung disease on the heart. It examines the chambers, valves, aorta, and the wall motion of the heart. ECHO also provides information concerning the blood pressure in the pulmonary arteries. This information is required to plan the transplantation surgery. Blood tests. Blood samples are required for both routine and specialized testing. In addition to tests and criteria for selection as a candidate for transplantation, patients are prepared by discussing at length the procedure, risks, and expected prognosis with the doctor. Patients should continue to follow all therapies and medications for treatment of the underlying disease, unless otherwise instructed by their physician. Since lung transplantation takes place under general anesthesia, patients are advised not to take food or drink from midnight before the surgery. Transplantation requires a long hospital stay, and recovery can last up to six months. Careful monitoring will take place in a recovery room immediately following the surgery and in the patient's hospital room. Patients must take immunosuppressive, or anti-rejection, drugs to reduce the risk of rejection of the transplanted organ. The body considers the new organ an invader and will fight its presence. The anti-rejection drugs lower the body's immune function in order to improve acceptance of the new organs. This also makes the patient more susceptible to infection. Frequent check-ups, including x ray and blood tests, will be necessary following surgery, probably for a period of several years. Lung transplantation is a complicated and risky procedure, partly because of the organs and systems involved, and also because of the risk of rejection by the recipient's body. Acute rejection most often occurs within the first four months following surgery, but may occur years later. Infection is a substantial risk for organ recipients. An early complication of the surgery can be poor healing of the bronchial and tracheal openings created during the surgery. A late complication and risk is chronic rejection. This can result in inflammation of the bronchial tubes or in late infection from the prolonged use of immunosuppressive drugs to fight rejection. Demonstration of normal results for lung transplantation patients include adequate lung function and improved quality of life, as well as lack of infection and rejection. According to the Scientific Registry of Transplant Recipients (SRTR), a total of 1,076 lung transplants and 31 heart-lungs transplants were performed in the United States in 2002. Of these transplants, 1,041 lungs were obtained from deceased donors and 35 from living donors. The survival rate at one year after transplant was 77% for lung transplants and 64% for heart-lung transplants. See also Heart transplantation ; Thoracotomy . Couture, K. A. The Lung Transplantation Handbook: A Guide For Patients, 2nd edition. Victoria, BC: Trafford, 2001. Hertz, M. I., R. M. Bolman, and J. M. Dunitz. Manual of Lung Transplant Medical Care. Minneapolis, MN: Fairview Press, 2001. Maurer, Janet R., Ronald F. Grossman, and Noel Zamel. "Lung Transplantation." In Textbook of Respiratory Medicine, 2nd edition, edited by John F. Murray and Jay A. Nadel. Philadelphia: W. B. Saunders Co., 1994. Schum, J. M. Taking Flight: Inspirational Stories in Lung Transplanation. Victoria, BC: Trafford, 2002. Algar, F. J., et al. "Lung Transplantation in Patients under Mechanical Ventilation." Transplantation Proceedings, 35 (March 2003): 737–738. Burns, K. E., B. A. Johnson, and A. T. Iacono. "Diagnostic Properties of Transbronchial Biopsy in Lung Transplant Recipients Who Require Mechanical Ventilation." Journal of Heart and Lung Transplantation, 22 (March 2003): 267–275. Chan, K. M., and S. A. Allen. "Infectious Pulmonary Complications in Lung Transplant Recipients." Seminars in Respiratory Infections, 17 (December 2002): 291–302. Helmi, M., R. B. Love, D. Welter, R. D. Cornwell, and K. C. Meyer. " Aspergillus Infection in Lung Transplant Recipients with Cystic Fibrosis: Risk Factors and Outcomes Comparison to Other Types of Transplant Recipients." Chest, 123 (March 2003): 800–808. Kyle, U. G., L. Nicod, J. A. Romand, D. O. Slosman, A. Spiliopoulos, and C. Pichard. "Four-year Follow-up of Body Composition in Lung Transplant Patients." Transplantation, 75 (March 2003): 821–828. Van Der Woude, B. T., et al. "Peripheral Muscle Force and Exercise Capacity in Lung Transplant Candidates." International Journal of Rehabilitation Research, 25 (December 2002): 351–355. American Society of Transplantation (AST). 17000 Commerce Parkway, Suite C, Mount Laurel, NJ 08054. (856) 439-9986. http://www.a-s-t.org . The National Heart, Lung, and Blood Institute (NHLBI). P.O. Box 30105, Bethesda, MD 20824-0105. (301) 592-8573. http://www.nhlbi.nih.gov/index.htm . Second Wind Lung Transplant Association, Inc. 9030 West Lakeview Court, Crystal River, FL 34428. (888) 222-2690. http://www.arthouse.com/secondwind . "Lung Transplantation." The Brigham Women's Hospital. http://www.cheshire-med.com/programs/pulrehab/transplant.html . "Lung Transplantation." Medline Plus. http://www.nlm.nih.gov/medlineplus/lungtransplantation.html . Lung transplantations are performed in a specialized organ transplantation hospital. Every transplant hospital in the United States is a member of the United Network for Organ Sharing (UNOS) and must meet specific requirements. Lung transplantations involve specialized transplant teams usually consisting of an anesthesiologist, an infectious disease specialist, a thoracic surgeon, an ear, nose, and throat (ENT) specialist, a cardiologist, and a transplant dietician who all perform with a high level of coordination. Are there organizations who can help me afford the cost of transplantation? How does the lung matching process work? How do I get on the lung waiting list? How will they find the right donor for me? How many lung transplantations do you perform each year? My brother, age 55, is out 13 years from a double lung transplant. Last year, he had to go back on oxygen therapy which he needs when he exerts himself such as going up steps, sawing wood, hunting, etc. He returned to work after his transplant and now has had to go on disability. Andy suggestions to get him off oxygen? He was transplanted at UPMC.